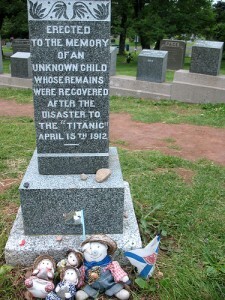 The grave of an unknown child who died in the Titanic disaster and was buried in Halifax. When the ill-fated Titanic disappeared beneath the Atlantic Ocean on April 15, 1912, Halifax played a key part in the rescue effort. In the Maritime Museum of the Atlantic you can see one of the original Titanic deck chairs and learn how the White Star Line employed four Canadian ships to help retrieve the bodies. Many of the victims found their final resting place in the city’s cemeteries. Fairview Cemetery in Halifax’s North End is where most of the graves are located – 121 victims from the world’s most famous sunken ship are buried here. Some of the markers are just simple numbers, while others who had families to pay are more elaborate. You’ll also find the graves of people who died in the Halifax Explosion in Fairview Cemetery. A few minutes will suffice for most people to have a look around but true history buffs may want to spend a couple hours examining the memorials in detail. Two other cemeteries in Halifax, the Mount Olivet Cemetery and Baron de Hirsch Cemetery, have a further 29 Titanic graves between them. Admission: Free to the cemeteries.